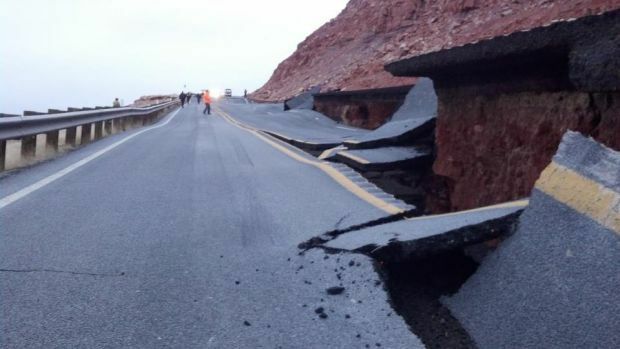 Page is cut off from points directly south by a deep, 150-foot-long crack in Highway 89 that occurred this morning about 25 miles south of Page, and it’s unknown when the road might be repaired. The road appears to have split in a few places, and is divided by a fissure greater than 5 feet deep in one area. Three accidents resulted from drivers hitting the large divide, with the most serious involving a person whose airbag deployed. She was transported to Page with minor injuries, according to state law enforcement officials. Page Unified School District is using a bypass to get students home about 45 minutes to 1 hour later than normal today and Thursday. It plans to change its pickup and dropoff times until the road is repaired. Highway 160 and State Route 98 are recommended as alternatives, adding about 49 extra miles to the trip between Page and Flagstaff. The agency is sending geotechnical experts up to look at the problem and does not know when it might be repaired. “We do know that it’s not going to be a short-term closure. This is significant damage and it’s going to require significant repair work,” said Tim Tait, ADOT spokesman. ADOT isn’t sure yet what happened, he said. “It’s really too early to speculate. We have geotechnical engineers that are en route to the scene. They’ll be able to place some monitors and get a sense of what’s happening,” Tait said. No seismic activity was reported in the area, the Arizona Earthquake Information Center out of Northern Arizona University reported. ADOT says weather wasn’t at fault. A handful of geologists at NAU inspecting photos say the problem appears to have been a landslide, based on what they can ascertain from photos. 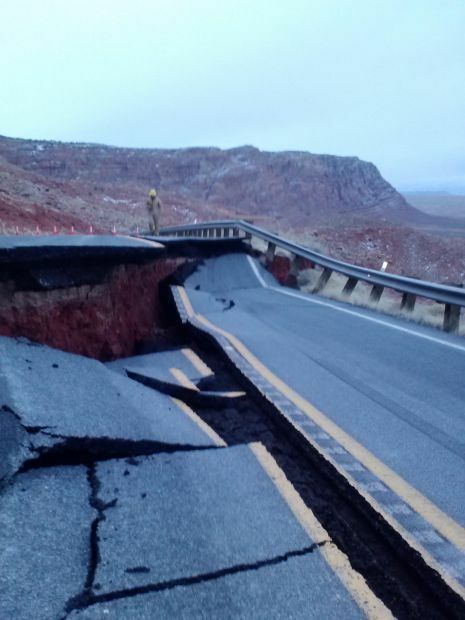 Daily Sun readers, how does the road collapse on Highway 89 at the Big Cut impact your daily life? In the late 50's when they improved 89 from Cameron and built the highway to the Page they were in such a hurry that they really did a very poor job. Engineers working on the dam in Page kept telling ADOT that there were eventually going to be major problems with the highway based on the poor construction. If you have driven from Cameron to The Gap prior to all the reconstruction done over the last 10-15 years you will know what I mean. Even going up to the Cut this prevaled. Perhaps careful ADOT research will find that unseen damage began on February 2 when a pack of groundhogs returned to their den.